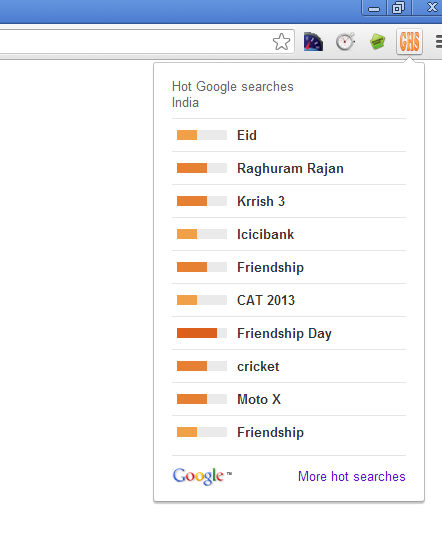 Step 1: Create an extension root folder called “Hot Searches”. Under the root folder, We’ll need to create a manifest file named manifest.json. The manifest is nothing more than a JSON-formatted table of contents, containing properties like your extension’s name and description, version number, and so on. Here we’ll use it to declare Chrome regarding what the extension is going to do, and what permissions it requires in order to do those things. The overview of all the manifest file fields is available here. In this “Google Hot Searches” extension, the manifest.json file looks like below. In the above example, we have mentioned the name, desc, author, etc., fields of the extension. In this sample extension, we are accessing cross-domain URL to get the locale. That is why we are mentioning the URL under the permissions section. Step 2: In the above step, we have placed two resource files under “browser_action” field. We need to place these files: icon.png and popup.html under the root folder. icon.png will be displayed next to the Omnibox, waiting for user interaction as shown below. 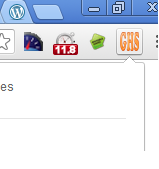 Visit chrome://extensions in your browser. Click on Load unpacked extension… and select the root folder of your extension. If the extension is loaded properly without having any errors, you will able to see the extension icon at the top of the page. The source code of the sample extension is available here. Was there supposed to be a link to the source code of the sample extension? I don’t seem to find any links or attachments for it. Still, nice tutorial to share.